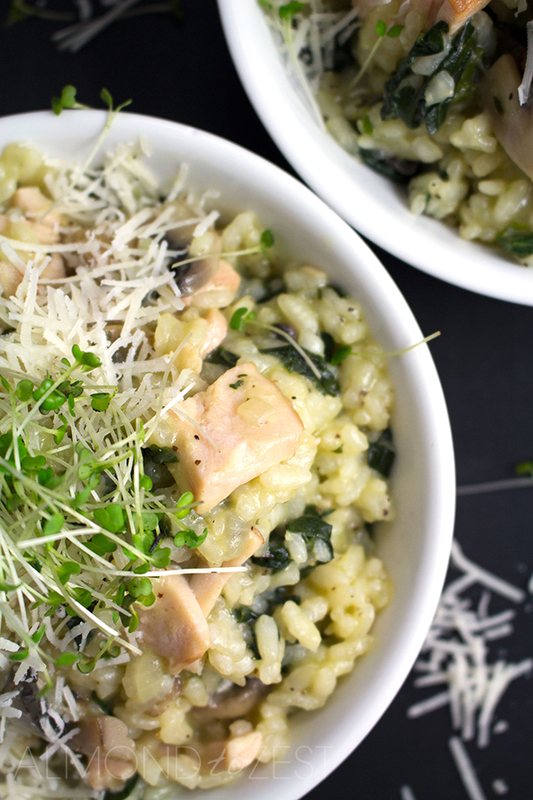 Learn how to make risotto like a pro with this simple and tasty smoked chicken, spinach and mushroom risotto recipe. Have you ever eaten risotto at a restaurant and wondered how they make it so unbelievable creamy? Ever dreamed about creating this magnificent dish at home but have feared that your version could not compete with the restaurant versions, so you haven’t even tried to recreate it? Well friends, today is your lucky day, cause I am going to share with you the secret to making the perfect risotto. The kinda risotto that will give you restaurant quality status and will have all your friends and family begging for more. There is something kinda special about digging into a big creamy bowl of perfectly cooked risotto, especially when it has been created at home, in your very own kitchen. Everything about it just screams “COMFORT FOOD”; from the way the steam rises off the bowl filled with the softly cooked grains to the warmth that radiates from within, from the first bite till the last. And to complete the whole comfort food package you need to have a combination of spectacular flavors. I have chosen smoked chicken, spinach and mushroom for my version cause I love the way these ingredients complement each other. Now there are a couple of elements that are needed in creating the perfect risotto, one of them is the need for patience and time. A good risotto will never reward you for trying to hurry it up by cooking it on a higher heat or by not letting it take its time to absorb all the liquid that is added over the cooking time. But if you take your time, add the liquids slowly and gradually, stir gently and then watch to make sure that those gorgeous grains of Arborio rice soak up all those liquids, then you will be rewarded with the softest and creamiest risotto ever. I find the process of making risotto to be super relaxing, almost mesmerizing in fact, a great cure for a hectic week. Another important factor is the use of good quality ingredients. 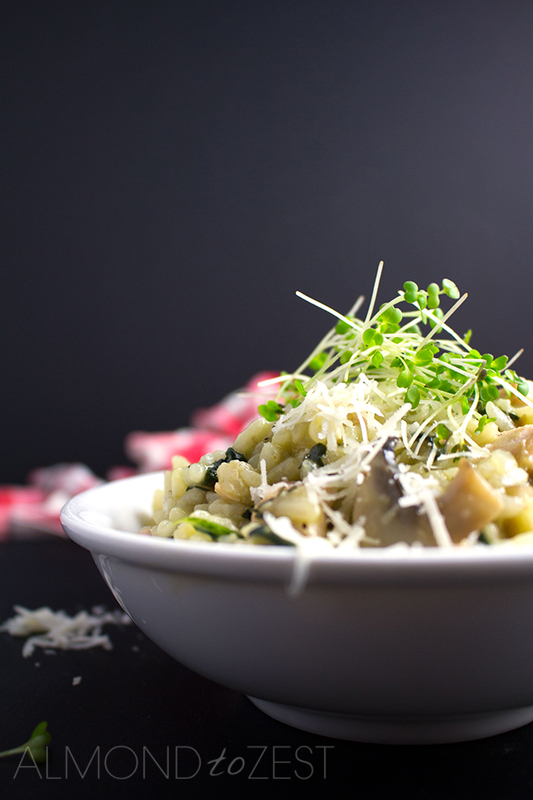 A good quality white wine, chicken stock and parmesan will go a long way in a dish like this, so don’t scrimp on these ingredients ok. And there you have it, my easy instructions to making the creamiest bowl of risotto around. Not as daunting as once thought, right? In a large pot or saucepan heat the 2 tablespoons olive oil over a medium to high heat. In a separate pot bring your chicken stock to the boil then reduce to a medium heat to ensure it will be hot whilst you are adding it to the risotto. Sauté your onion and garlic in the olive oil for a couple of minutes until softened. Add the mushroom and cook for another couple of minutes until they have become tender. Add your Arborio rice along with the remaining tablespoon of olive oil and stir constantly for 2-3 minutes until all the grains of rice have been coated in the oil and lightly toasted. At this point add the white wine and stir quickly until it has almost evaporated. Add enough chicken stock to just cover the rice and reduce the pan to a low to medium heat. Add the smoked chicken and stir slowly until the stock starts to become absorbed. Continue to add the stock ladle by ladle and slowly stir until it has all absorbed. This process should take 15-20 minutes. When the stock has been absorbed remove the pot from the heat. Add the spinach, thyme, butter, Parmesan and seasoning. 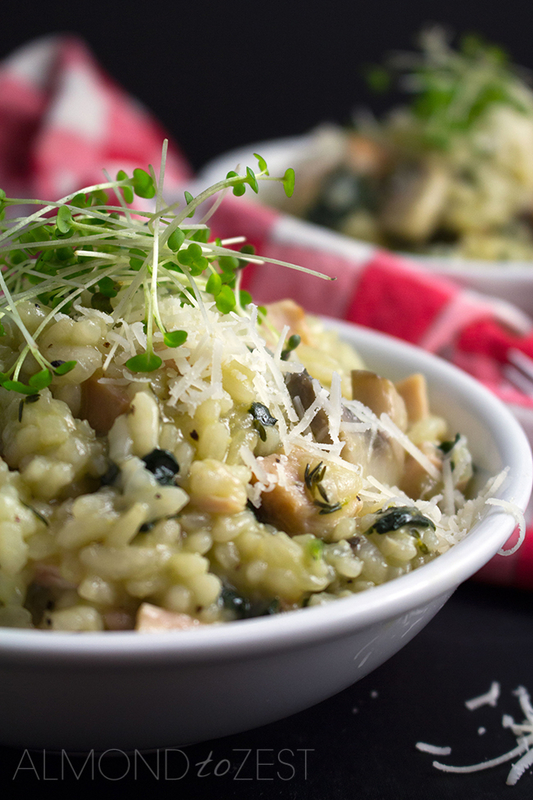 Stir together quickly and allow risotto to sit for a couple of minutes before serving.